Klikněte na fotografii a zobrazte všechny dostupné fotografie k Sunny Island Apartment B33. Situated in Chernomorets, Sunny Island Apartment B33 provides accommodation with a private pool, a terrace and sea views. Set on the beachfront, this property features a private beach area, a seasonal outdoor swimming pool, a fitness centre and free WiFi. The apartment is composed of 1 bedroom, a dining area, a fully equipped kitchen, and 1 bathroom. A flat-screen TV with satellite channels is offered. 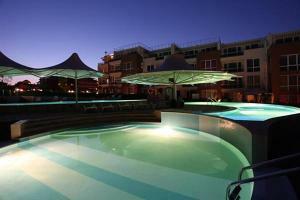 Sunny Beach is 61 km from Sunny Island Apartment B33, while Burgas City is 26 km from the property. Burgas Airport is 36 km away.